Broadway In Chicago and Scott Sanders Productions announced that the world premiere of the new comedy musical, TOOTSIE, will play a pre-Broadway engagement this fall at Broadway In Chicago's Cadillac Palace Theatre (151 West Randolph Street, Chicago, IL) from September 11 - October 14. TOOTSIE will come to Broadway in spring 2019. The world premiere comedy musical, TOOTSIE, tells the story of a talented but difficult actor who struggles to find work until an audacious, desperate stunt lands him the role of a lifetime. 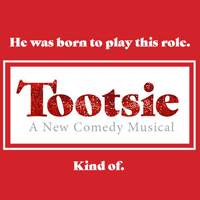 TOOTSIE will star Tony Award nominee SANTINO FONTANA as struggling actor Michael Dorsey. Santino is well known to TV and film audiences for his role as Greg on "Crazy Ex-Girlfriend" and for providing the voice to the villainous 'Prince Hans' in the blockbuster animated film, Frozen. His many Broadway credits include his Tony-nominated performance in Rodgers & Hammerstein's Cinderella, Billy Elliot, Sunday in the Park with George, and Brighton Beach Memoirs. TOOTSIE features an original score by Tony Award nominee David Yazbek (The Band's Visit, The Full Monty, Dirty Rotten Scoundrels), a book by Robert Horn (13; Dame Edna, Back with a Vengeance), choreography by Tony Award nominee Denis Jones (Holiday Inn, Honeymoon in Vegas), and musical direction by Andrea Grody (The Band's Visit). TOOTSIE will be directed by eight-time Tony Award nominee and Olivier Award winner Scott Ellis (She Loves Me, On the Twentieth Century).